Home / Politics / Terrorism fallout shelters: Is it time to resurrect nuclear civil defense? Fifty-five years ago, on Oct. 6, 1961, President John F. Kennedy advised Americans to build an underground protective room, commonly known as a “fallout shelter,” in their homes. The American people heeded his advice and began an enormous grassroots effort to construct fallout shelters in every private residence and public building. Today, those shelters in the basements of 1960s-era homes are largely used for storage. 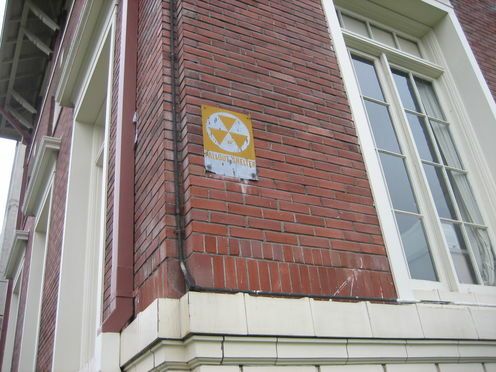 The only reminder of the public shelters is the occasional yellow fallout shelter sign that still remains affixed to the outside wall of some buildings. Now, no one builds fallout shelters. But, why not? The nuclear weapons are still around. As a radiation protection expert and a professor of radiation medicine, I am sometimes asked this question. The answer is an interesting story that should give us all pause, especially as we now face new nuclear weapon threats. The main reason we no longer build fallout shelters is that as nuclear bombs have grown in size and number, the prospects of surviving a nuclear war – even in a shelter – have decreased. A study by the RAND Corporation in 1966 determined that as many as 62 percent of all Americans would die in a nuclear exchange with the Soviet Union, and painted a pretty grim picture of the lives of the survivors. As a result, fallout shelters became seen as an ineffective way to protect the lives of the vast majority of the population. Gradually, civil defense efforts moved away from nuclear bombs and concentrated on everyday threats that could be more easily defended against, such as tornadoes, earthquakes and hurricanes. How, then, could Americans protect themselves from the threat of nuclear holocaust if a nuclear war between the United States and the Soviet Union was not survivable? Mutually assured destruction, commonly known as “MAD,” became the cornerstone of our nuclear defense strategy. Since no sane leader would initiate a suicidal war, an arms race began in order to produce so many nuclear weapons on both sides that only a deranged person would think it wise to launch a nuclear attack. The basic defense strategy, using the MAD approach, was to make nuclear war such an unthinkable option that nuclear weapons would never be used offensively by either side. But the nuclear arms race became a huge financial burden, and each country soon had excess capacity to annihilate the other many times over. Talks were initiated between the U.S. and the Soviet Union (now Russia) to limit the production of new nuclear weapons and even reduce the existing stockpiles. Beginning with the Strategic Arms Reduction Treaty (START) of 1991, and culminating with the New START agreement that entered into effect in 2011, stockpiles of nuclear weapons have been reduced from a peak of about 35,000 strategic nuclear warheads held by each country in the mid-1980s to about 7,000 each today. With regard to deployed strategic nuclear weapons, the goal is to limit each side to just 1,550 by Feb. 5, 2018. Whether this reduction in nuclear warheads has made us any safer is debatable. Both sides still retain enough to maintain a defense strategy of mutually assured destruction. Certainly, the societal costs of feeding the massive nuclear war machine have been reduced to the benefit of all. But, a war between superpowers is not the only nuclear weapon threat Americans currently face. Today, smaller nations and terrorist groups, such as al-Qaida, are seeking nuclear weapons. Some nations, like North Korea, already have them. Others may be a decade away. It is not unreasonable to believe that the use of a single nuclear weapon by a rogue nation or a terrorist group now poses a more likely scenario for a nuclear confrontation than a nuclear war between Russia and the United States. Nevertheless, some downplay the threat of a nuclear attack to the United States’ mainland by these new nuclear adversaries. They argue that adversaries not only need nuclear weapons, but must also be able to deliver them to their targets. Since missile technology is not a strength of small nations and terrorists, the lack of launch capacity is often cited as a major obstacle to such would-be nuclear attackers. But recently, North Korea’s successful missile launch tests seriously challenge this assumption about limited missile capabilities. Regardless, missiles aren’t essential to deliver a nuclear weapon. A bomb in a cargo ship in New York harbor is just as much a threat as one launched by missile from overseas. And, as bombs are miniaturized, the prospects of detecting and stopping nuclear weapons coming across our borders and through our ports is greatly reduced. We are entering an era in which multiple small countries or terrorist organizations may acquire a few “small” nuclear weapons in hidden locations around the world. Such small weapons could be used to inflict a considerable amount of damage, but nothing on the scale what we envisioned during the Cold War. These small bombs are probably survivable with fallout shelters that would be useless during a full nuclear war. In fact, these relatively small nuclear weapons – if you consider Hiroshima-sized bombs to be small – are precisely the size that were envisioned when fallout shelters were first proposed for civil defense. Is it time to resurrect nuclear civil defense in response to the increasing threat from terrorists? Although experts think it unlikely that terrorists are currently technologically sophisticated enough to make their own nuclear weapons from scratch, even if they had access to enriched uranium (the required fuel), there is no question that they could steal one from some small (or large) nuclear nation, particularly during the chaotic aftermath of a coup. Turkey had nuclear weapons at the time of its recent coup attempt, for example. Alternatively, terrorists could obtain them by discretely purchasing them from renegade nuclear nations, or clandestinely by bribing military officials. One nuclear bomb, in one ship, in one harbor is all it takes to get into the nuclear terrorism business. It is clear that mutually assured destruction is a defense strategy that only works between stable nations with sane leaders. Mutually assured destruction is not a strategy that works against nations with unstable rulers, such as in North Korea, or enemies with no known address to which you can deliver a retaliatory strike, such as terrorists. For these adversaries, we need an alternative strategy to protect ourselves. Right now we don’t have one, other than screening cargo for nuclear weapons and weapons-grade uranium. And, as I describe in my book, “Strange Glow: The Story of Radiation,” mock tests of this screening program have revealed significant weaknesses. I believe we need to better address this new and growing threat of nuclear terrorism right now, and devote as many resources as necessary toward dealing with it. If we don’t find a more effective strategy to thwart nuclear terrorism soon, we may be forced to go back to fallout shelters as our only protective option, whether we like it or not. Timothy J. Jorgensen does not work for, consult, own shares in or receive funding from any company or organization that would benefit from this article, and has disclosed no relevant affiliations beyond the academic appointment above.